I spent a long time trying to find a healthy pancake recipe. You could take your favorite recipe and substitute a few ingredients here or there, and they turn out decent, but I wanted more. Eventually I gave up the search and then one day I came across the famed cottage cheese page. 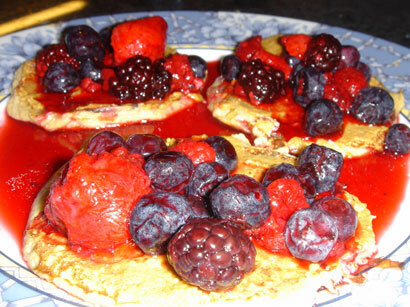 On there was a simple recipe for cottage cheese pancakes, a highly unexpected ingredient. Using that recipe as a guideline, I believe I have created the world’s healthiest pancakes! I’ve been making these for years now, and while they aren’t 100% identical to traditional pancakes, they are close enough and everyone loves them. I didn’t think this list of ingredients looked too good but it was delicious and definately healthy! I have a bit of a sweet tooth so I sometimes pour a little maple syrup on top. You’d never know there was cottage cheese inside! Are you afraid of egg yolks? They might contain most of the egg’s fat, but they are also rich in vitamins A, E, D, and K as well as a few antioxidants (thank you, Wikipedia). No need to fear the yolk! No! I am not afraid of egg yolks, I simply choose to use egg whites or egg substitute when the difference is not noticeable. Egg whites provide most of the protein of an egg which is the highest quality protein in nature. The yolks do contain vitamins and antioxidants but are very high in cholesterol and contain a considerable amount of fat, 25% of which is saturated. I prefer to replace the unhealthy fats with a healthier fat such as peanut butter that I spread on top. There’s also the consideration that I can pour from a carton with ease, but I am terrible at cracking eggs. Nothing worse than an unexpected crunch in your pancakes. Hmm, yes, it’s true that some of the nutrients found in egg yolks are controversial. Is cholesterol really bad for us? Is saturated fat really bad for us? Ask different people and you’ll get different answers. Walter Willett contends that most of us don’t need to worry too much about eating eggs because our bodies are well-equipped to process dietary cholesterol. I really liked his book, Eat, Drink, and Be Healthy. It opened my eyes to a new way of thinking about food and health. But back to the question at hand: if I had to choose, from a taste perspective, I would also choose peanut butter, so there you go! Ever try a tofu scramble? Tofu scrambles sidestep the whole issue of eggs and pair well with a nice muffin or toast with peanut butter. And I empathize with you on the shells! I consider myself a decent baker and yet I STILL find the occasional shell fragment in my muffins! Yuck! Your website is too cool. I like it! If I want to make them with the entire egg how many eggs should be used? Want to make it even healthier? Use oat bran! I made them like that this morning and they worked great, and soooo healthy. Oat bran has more fiber than regular oatmeal. I also stirred in some vanilla whey powder into half of the batch and those were delicious as well= perfect bodybuilders pancakes. So you used 1 cup of oat bran and no oats? I wouldn’t think it would soak up as much liquid but I’ll have to give it a try, thanks for the tip! Yeah, I wasn’t sure if it would work, since oat bran doesn’t expand and coagulate nearly as much, but it worked fine! I blended everything thoroughly and the pancakes cooked and held together perfectly. Can you replace the cottage cheese with anything non dairy? That’s a good question Cheryl, but I don’t have a tried and tested answer for you. However, I would suggest trying either a soy-based cheese (do they make soy cottage cheese?) or even a firm tofu. Tofu might be your best bet, since it has such minimal flavor. If you try it and it works out, let me know! Can’t say that I have, but you shouldn’t need to precook them first. I realize they’re harder but if you blend them well enough, it should be fine. Rather than precook them (which takes extra time, and unless you cool them completely it could mess up the batter) – I would suggest following the recipe above but letting the mixture sit longer. That way, the steel cut oats (even if they don’t get chopped up AS fine) have a chance to soak up the liquid and reach a happy saturation point for maximum pancake deliciousness =]. That’s just a suggestion though, I don’t have any tests to back it up! Let me know how it goes Stephanie! Also, I should point out that I’ve “updated” this recipe here: Banana Pancakes. It’s essentially the same, but a better picture, more ideas and has more comments! What’s the calories, fat, cholesterol, protein? It has all of the nutrition facts underneath the recipe. Enjoy!